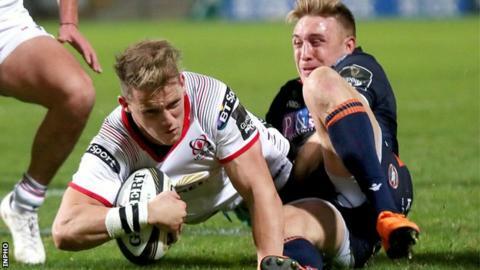 John Cooney's injury-time penalty capped an unlikely Ulster recovery in a 30-29 Pro14 win over Edinburgh. For the second week in a row, Cooney held his nerve to kick the winning points as Ulster recovered from 13-0 adrift after the opening 15 minutes. Tries by Tom Brown and James Johnstone had put a dogged Edinburgh in control. A stunning solo try by Craig Gilroy sparked the Ulster fightback before Edinburgh's Simon Hickey and Cooney traded penalties in a dramatic climax. The Scottish side were leading 16-6 at half-time at Kingspan Stadium as their breakdown dominance was rewarded with Brown's early try. Will Addison and Cooney both crossed as Ulster belatedly came to life in the second half before Gilroy's superb 60-metre score put them ahead. Hickey converted a monster penalty in the 79th minute to push the visitors back into the lead but Ulster came thundering back down field and Cooney kept his cool to land the winning penalty with the final kick of the game. Brown's try capped an electric start by Richard Cockerill's men. Prompted by a series of towering box kicks from scrum-half Henry Pyrgos, Edinburgh won the early territorial battle and also showed impressive grit at the breakdown that was rewarded with a pair of straightforward penalties for Hickey. Edinburgh flankers Luke Hamilton and Jamie Ritchie were stubbornly effective in slowing down the Ulster ball and it was no surprise when the visitors surged further ahead in the 15th minute when Matt Scott and Stuart McInally made inroads into the Ulster defence before Pyrgos found Brown with a wonderful looping pass and the winger scored in the corner. The Irish province were struggling to find a way through their opponent's defensive wall and had to rely on a couple of Cooney penalties to keep them in contention until flanker Jordi Murphy thought he had scored on his debut only for the television referee to rule he had been bundled out of touch. Seeking to recover from 10 points down at the break, Ulster threw caution to the wind at the start of the second half with Addison, Gilroy and Stuart McCloskey all off-loading out of the tackle as they took the game to their guests. But, against the run of play, Edinburgh pushed further ahead when Blair Kinghorn turned defence into a blistering attack down the right wing. The Scotland full-back was tackled by Addison but he popped a pass to Johnstone, who rounded Henry Speight with ease to score under the posts. An electric burst of pace by Cooney gave Ulster's some vital territory and, although Speight could not ground the ball over the line, the home side eventually got their opening try in the 54th minute when Addison slipped through a gap after racing onto a perfectly weighted pass by Billy Burns. Hickey kicked another penalty to keep the visitors in control on the scoreboard but the momentum was now with the hosts and they conjured a stunning second try when Cave's delayed pass sent Addison down the left touchline before he found the supporting run of Cooney for a well-worked try. That score was later eclipsed by Gilroy's effort as the winger received the ball deep in his own half before outpacing the defence and then wrong-footing the covering Kinghorn to score a scintillating try that was converted by Cooney to give Ulster the lead for the first time. There was still time for further drama as Edinburgh's weary forwards forced their way up field and Cooney conceded a needless penalty at the scrum. But the scrum-half made amends in stoppage time as he kept his cool to score at the death. Replacements: McBurney, O'Sullivan, Herbst, O'Connor, Reidy, Shanahan, Curtis, Kernohan. Replacements: Ford, Dell, McCallum, McKenzie, Crosbie, Kennedy, Van der Walt, Johnstone.